Students take part in critical thinking opportunities to discuss and have a greater appreciation for one's likes and dislikes, as it relates to themselves and their communities. Students develop respect and enthusiasm for the arts. This will create an opportunity to cultivate an appreciation of the arts within the hearts and minds of our youth. Through artistic theatrical presentations students (grades 3 through 6) develop and apply "skills for living" that will enrich their lives and increase opportunities for success. These skills include hard work, commitment and teamwork. Creative expression is the doorway through which young minds can explore different aspects of their personality while simultaneously celebrating their unique individuality and heritage. Students take part in the series entitled, "My Story". The series is hosted by guests from various communities who share their person and professional stories of challenges and courageousness. The students encounter these career development workshops on-site, as well as, off-site. 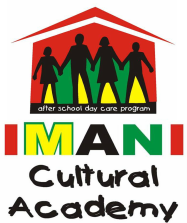 Click here to check out fun Recreational Activities at IMANI Cultural Academy!